Today we’re launching a native Classroom mobile app for both Android and iOS to help teachers and students be more collaborative in the classroom and save even more paper and time. Snap a photo: Right from the assignment page in the mobile app, students can snap a photo and attach it to their assignment. Share from other apps: Students can also easily attach images, PDFs and web pages from other apps to their assignments. Offline caching: Class streams and assignment information are automatically cached every time you open the app with an Internet connection, so that you can see them when you don’t have a connection. 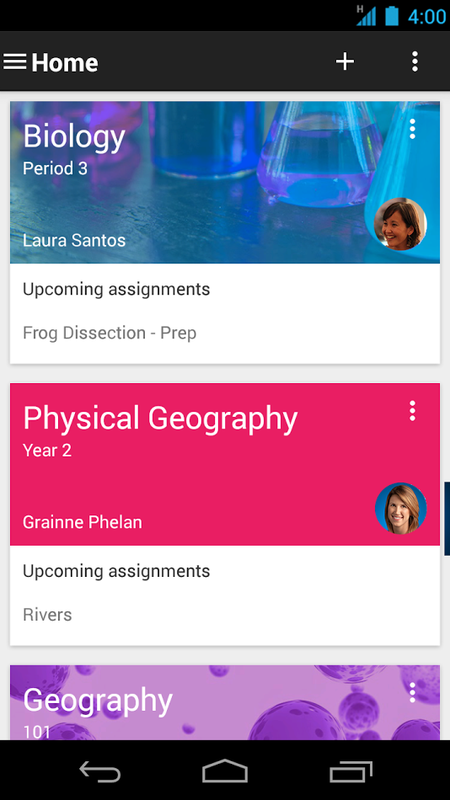 Teacher Assignments Page: On Classroom for desktop, we’re launching a teacher assignments page, where teachers will be able to get quick access to any assignment, see how many students are done and mark assignments as reviewed. Archive Classes: We also know that classes don’t go on forever —that’s why today we’re launching the ability to archive classes. Archiving a class will remove it from the home page and make it read-only — teachers and class members can still view valuable information in archived classes, but can’t make any changes or turn in assignments.